Veronika Grimm (born in 1971) has been Professor of Economic Theory at Friedrich-Alexander-Universität Erlangen-Nürnberg (FAU) since 2008. She studied economics and sociology at the Universities of Hamburg and Kiel and received her PhD in economics from Humboldt University Berlin in 2002. After her PhD she was an assistant professor at University of Alicante and spent some time at CORE (Université Catholique de Louvain) and ULB (Brussels), before she joined University of Cologne, where she earned her habilitation in 2008. Her research interests are in the fields of market design (economic engineering) , behavioral economics, industrial organization, and energy economics. 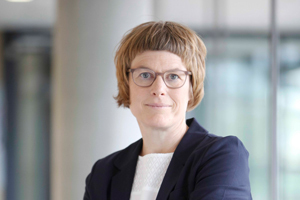 She is the founding director of the Laboratory of Experimental Research in Nuremberg (LERN) and head of the division „Energy Market Design“ at Energie Campus Nürnberg (EnCN). Veronika Grimm is a fellow of CESifo and member of several scientific commitees and boards. She has published widely in prestigeous economics journals, such as the Journal of Economic Theory, the Economic Journal, Games and Economic Behavior, or the European Economic Review. Her research has been founded by the German Research Foundation, as well as other public and private institutions. She also regularly cooperates with public institutions or firms in joint projects. "Stärkung von Investitionen in Deutschland" - Stellungnahme der Expertenkommission im Auftrag des Bundesministers für Wirtschaft und Energie, Berlin. attention is paid to booking prices for entry or exit capacity. Decarbonisation of the mobility sector is an important factor in the fight against climate change. Battery-powered electric vehicles can play an important role in this process. However, special challenges may arise in the fields of range, charging infrastructure, grid stability and heavy goods vehicles. In the short to medium term, it can therefore be assumed that battery electric vehicles will be supplemented by the use of synthetic fuels such as hydrogen. Efficient logistics is an elementary component of hydrogen mobility, especially due to the difficult handling and low volumetric energy density of the gas. In the research focus "Efficient Hydrogen Logistics" of the partial project "Storage B" of EnCN2, an interdisciplinary team of engineers and economists is working on the future of hydrogen mobility. So-called LOHC (Liquid Organic Hydrogen Carrier) offer an innovative alternative for hydrogen logistic to compressed hydrogen, cryogenic hydrogen or on-site production by electrolysis. The hydrogen molecules can be chemically bound to the liquid LOHC by catalytic hydrogenation and then stored and transported as a liquid without loss. The hydrogen is released at the filling station and the LOHC can be used for reloading. Mathematical models are used to investigate and classify the various technologies and mobility concepts in terms of their economic efficiency and their influence on the energy system. In the project “Energy Markt Design” within EnCN2 a team of researchers from economics, mathematics, and law analyses the economic and regulatory environment for the transformation of the energy system. The main objectives are to enhance the methods in energy market modeling and to contribute with well-grounded analyses to the policy discourse in Germany and Europe. For the electricity market, the focus is on the steering effect of market designs on regulated transmission expansion and private investments, as well as on the identification of frameworks at the distribution level that provide regional stakeholders with business models for the provision of flexibility measures. In order to address these complex issues, mathematical techniques are developed within the project that allow for solving the respective models. Another key research topic results from the advancing sector coupling in energy markets. Within EMD, gas market models, that are developed within DFG Transregio 154 (Simulation and Optimization of Gas Networks) in cooperation with project partners, are applied to evaluate the European gas market design. The long-term objective of the research group is an integrated assessment of the electricity and gas market design and their combined effects on investment decisions. The goal of this project is the analysis of the relation between (i) the equilibria of simple models of competitive natural gas markets, using complementarity problems for modeling the behavior of different players, and (ii) the solution of corresponding single-level welfare maximization problems. The understanding of this fundamental relation is a prerequisite for an analysis of the current entry-exit gas market design in Europe. Similar questions have been studied in detail in the context of electricity market modeling in the past. For natural gas markets, however, the addressed questions are much more complex and not yet well understood for adequate models of gas physics. The reasons for the high level of complexity is twofold: First, gas flow through pipeline systems is inherently nonconvex due to gas physics. This renders classical first-order optimality conditions possibly insufficient. Second, the operation of gas transport networks comprises the control of active network devices like (control) valves or compressors. These devices introduce binary aspects and thus a further type of non-convexity to the models of the underlying equilibrium problems. As a result of the project we will obtain a first reference model that combines gas physics and a market analysis in a well-understood way. This will lay the ground for multilevel models of entry-exit natural gas markets that account for network characteristics. Beyond that, our results will enhance the understanding of binary equilibrium problems. Facing the current debate about the energy transition, in this project we investigate flexible demand options as well as changed market designs and conditions as an alternative to network expansion. Further, the optimal technology mix as well as locational choice of renewable energy generation will be determined endogenously. This project will be the basis to enhance the process of network expansion systematically and to include approaches and flexibility options which have been neglected so far. In this research project, we analyze investment incentives for flexible manufacturing facilities within the energy market system. We propose a multi-stage equilibrium model which incorporates generation capacity investment, network expansion and redispatch, and include enhancements regarding a flexible production approach. The model allows to investigate incentives for flexible production as well as locational choices and the impact of flexible energy demand on the energy market as a whole. In particular, we explore the profitability of flexible production units for different shares of flexible energy consumers in the electricity market. Furthermore, we examine from which point on flexible production units will have a considerable influence on energy price development and the extent to which price fluctuations will be mitigated by flexible consumption. The aim of the project is to analyze connections between manager behavior and firm level variables. The first step is the identification of suitable behavioral indicators in questionnaires that will be validated in controlled laboratory experiments. The experiments are meant to examine and evaluate fundamental relationships between different indicators and economically relevant decision making. The project points towards providing the basic elements to collect the identified behavioral indicators by means of short questions or simply decisions within questionnaires. Im Rahmen des Kooperationsprojektes SWARM der N-ERGIE AG und dem Energie Campus Nürnberg (EnCN) beschäftigt sich unter anderem der Lehrstuhl für Informatik 7 (Rechnernetze und Kommunikationssysteme) mit den Fragestellungen, unter welchen Bedingungen Privathaushalte in innovative Stromspeicher investieren, wie sich diese Speicher auf die Stabilität des Stromnetzes auswirken und welchen ökonomischen Nutzen sie aus Sicht des Netzbetreibers bzw. der Privathaushalte schaffen. Übergeordnetes Ziel der Untersuchungen ist es, Erkenntnisse über vernetzte Speicher zu gewinnen und zu vertiefen.Das von der Caterva GmbH entwickelte Energiespeichersystem (ESS) mit einer Gesamtleistung von 20 kW und einer Bruttokapazität von 21 kWh richtet sich an Privathaushalte, die deutlich mehr als die durchschnittlich üblichen 30 Prozent ihres selbst erzeugten PV-Stroms nutzen möchten, da das ESS eine hohe Deckung des individuellen Strombedarfs aus Eigenerzeugung ermöglicht. Die Innovation des Systems liegt jedoch in seiner zweiten Funktion: Die Energiespeichersysteme können sich zu einem virtuellen Großspeicher vernetzen, der am Primärregelleistungsmarkt teilnimmt und damit eine Stabilisierungsfunktion im Stromnetz übernimmt. Der virtuelle Großspeicher speichert Strom bei einem Überangebot im Netz und speist umgekehrt bei Strombedarf in das Netz ein.Der Lehrstuhl für Informatik 7 (Rechnernetze und Kommunikationssysteme) entwickelt ein Simulationsmodell eines Kleinspeicher-Verbunds. Ziel des Modells ist es, die technischen Auswirkungen der Speicher auf die Netze zu ermitteln, sowie den ökonomischen Nutzen sowohl für die beteiligten Privathaushalte als auch für das gesamte Energiesystem zu identifizieren. Within the cooperative project SWARM between the N-ERGIE AG and the Energy Campus Nuremberg (EnCN), the chair of economic theory deals with investment incentives in innovative energy storage systems of private households and the influence of these storages on the supply grid. Further, we investigate the economic advantages they provide to supply system operators or households. The overall goal of the research activities within the SWARM project is to gain knowledge about connected distributed energy storages (swarm storage) running as one virtual electricity storage. International Graduate Program "Evidence Based Economics"
The International Graduate Program Evidence-Based Economics (EBE) is a joint undertaking of the Universities of Munich, Erlangen-Nuremberg and Regensburg generously funded by the Elite Network of Bavaria. The objective of the program is to train doctoral students to work at the frontier of theory-guided, evidence-based economics. Integrating theory, empirical methods, and policy analysis in both training and research is the main innovation. It focuses on an integrated methodological approach and allows for substantive applications from different fields in economics. Within the porgram, we closely cooperate with firms, non-profit organizations, research institutions, and leading scholars worldwide, both in training and research supervision. The aim of the project is to analyze bargaining processes and their impact on gender wage differentials. In particular, we want to identify potential leverages for a reduction of the remaining gender wage gap under collective bargaining agreements. An important aspect is the gender segregation in pay grades. Whereas men and women are paid equally within grades, the classification of jobs will probably play a crucial role. The research project conducts stylized negotiations to gain insights in wage formation processes. Based on economic experiments, we investigate in particular the following questions: Why and how might a gender wage gap arise from or in spite of collective bargaining? Can the gender wage gap be reduced by increasing transparency? In this project we conducted an experimental study among European citizens regarding cross-cultural perceptions related to trust in two dimensions: volunteerism and honesty. We used representative samples from five major economies of the Euro area: France, Germany, Italy, the Netherlands, and Spain. We find that European citizens rely on nationality to infer behavior. Assessments of behavior show a north/south pattern: participants from northern countries are perceived to be more honest and to provide more effort in a volunteering game than participants from southern countries. Actual behavior is, however, not always in line with these assessments. Assessments of honesty show strong evidence of social projection: Participants expect other European citizens to be less honest if they are culturally closer to themselves. Assessments of volunteerism instead show that both northern and southern Europeans expect higher performance in northern than in southern European countries. The project focuses on the question how reputation evolves in economic transactions. Oftentimes, business partners cannot rely on their own experience with their counterpart. Thus, the reputation of business partners plays a crucial role in many markets. While the effect of reputation has been the focus of many studies within this field of research, the present investigates the formation of reputation both theoretically and empirically. We are particularly interested in reputation that evolves in the direct interaction between business partners while institution-based reputation mechanisms (e.g. formal rankings on online platforms or media coverage) are deliberately excluded. On the basis of game theory and laboratory experiment we investigate the conditions that foster the formation of reputation and the circumstances that rather prevent their evolvement. In a second step, the results from the laboratory experiments will be validated with field data. Biotechnologische und lebenswissenschaftliche Innovationen zeitigen nicht nur immense Fortschritte auf den unterschiedlichsten Feldern naturwissenschaftlicher und technischer Forschung und treiben damit auch ökonomische Entwicklungen voran, sondern erfassen mit ihrer Dynamik auch grundlegend das Verhältnis von ‚Natur‘, ‚Technik‘ und ‚Gesellschaft‘. Bio-Objects werden weit über den jetzigen Stand hinaus eine Schlüsselposition in dynamischen, wissensbasierten Gesellschaften und Ökonomien einnehmen; durchkreuzen etablierte Kategorien (u.a. ‚natürlich' vs. ‚künstlich'; und fundamentaler ‚Objekt‘ vs. ‚Subjekt‘ und ‚Natur‘ vs. ‚Kultur‘), überschreiten damit die Grenze des bloß Dinghaften und gewinnen gegenüber ihren Entstehungs- und Verwendungskontexten eine gewisse Selbstständigkeit und Unabhängigkeit. Ziel des Projektes ist es, (1) Bio-Objects als Treiber biotechnologischer Entwicklungen zu identifizieren, (2) sie in ihrer Multidimensionalität zu erfassen und (3) ihre Auswirkung auf Akteure und Gesellschaft zu untersuchen. Die angesichts dieser Komplexität zu erwartenden Konflikte sollen antizipiert und gestaltet werden. Mit diesem Approach bringt das Projekt alle fünf Fakultäten an der FAU zusammen und wird durch Expertise von Herbert Gottweis aus Wien sowie Jochen Taupitz aus Mannheim flankiert.